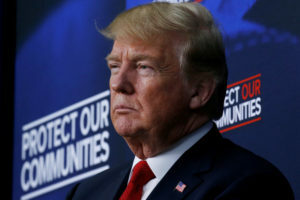 WASHINGTON — President Donald Trump is making broad generalizations about people who arrive illegally in the United States, casting them all as violent criminals when statistics say otherwise. He’s also suggesting that a newly signed executive order would solve the problem of family separations at the border, even while continuing to blame Democrats for separations that result from his own policy of criminally prosecuting every adult entering the U.S. illegally. His comments capped a dizzying week of questionable claims, non-sequiturs and outright misstatements amid fallout over his treatment of refugees crossing the U.S.-Mexico border. Meanwhile, on North Korea, Trump contradicted his own Defense Department by saying that leader Kim Jong Un had already begun to fully rid the country of nuclear weapons and wavered back and forth on statements regarding the level of threat the North posed to the U.S. He also left out important context about the creation of new U.S. jobs and rising wages, overstated the impact of a new health insurance option for small businesses that appeared aimed at undercutting an Obama-era law, and repeated misleading claims about a special counsel’s probe into Russian meddling in the 2016 election. TRUMP: “They can be killers, they can be thieves, they can be horrible people.” — weekly address Saturday. TRUMP: Democrats “think immigration is being weak on the border, which is therefore allowing tremendous crime to come into our country.” — remarks Saturday to Nevada GOP convention. TRUMP: “I always hear that, ‘Oh, no, the population’s safer than the people that live in the country.’ You’ve heard that, fellas, right? You’ve heard that. I hear it so much, and I say, ‘Is that possible?’ The answer is it’s not true. You hear it’s like they’re better people than what we have, than our citizens. It’s not true.” — remarks Friday. THE FACTS: His generalization about people in the U.S. illegally is overdrawn, dismissing without evidence several studies showing immigration does not lead to increased crime. The studies from social scientists and the libertarian think tank Cato Institute have shown that people here illegally are less likely to commit crime than U.S. citizens, and legal immigrants are even less likely to do so. A March study by the journal Criminology found “undocumented immigration does not increase violence.” The study, which looked at the years 1990 through 2014, argues that states with bigger shares of such people have lower crime rates. READ MORE: At hub for border crossings, families spread throughout U.S.
TRUMP: “Open Borders Democrats support the loopholes that prevent families from being detained and removed together — they just want everyone to be released into our country no matter how dangerous they are.” — weekly address Saturday. TRUMP: “Democrats, fix the laws…Strong Borders, No Crime!” — tweet Sunday. THE FACTS: His assertion that Democrats are fully to blame for continued family separations is misplaced. While Republicans hold a 51-49 majority in the Senate, there are enough Democrats to block legislation sought by Trump on a procedural vote that would also provide money for a border wall. House Republicans, meanwhile, are internally divided over a suitable plan. As thousands of children were separated from their parents at the Mexican border, President Trump and his supporters doubled down, advancing his Republican approval rating to the highest in history. Many in his base came together to either deny the situation or sympathize with the claim that Trump is under attack. NewsHour Weekend Special Correspondent Jeff Greenfield joins Hari Sreenivasan. Trump has blamed “bad legislation passed by the Democrats” for driving families apart. But the 2008 law he appears to be referring to passed unanimously in Congress and was signed by a Republican president. It was focused on freeing and otherwise helping children who come to the border without a parent or guardian. It does not call for family separation. While blaming Democrats, Trump in the past week has also told congressional Republicans to “stop wasting their time” on immigration legislation until after November. TRUMP on Kim Jong Un: “We get along very well…He’s a great negotiator. I think he sees a tremendous future for North Korea. But we want to have it denuclearized, and that’s what’s happening.” — remarks Saturday at roundtable on tax reform in Las Vegas. Trump had pointed to the summit’s discussions on denuclearization in asserting that North Korea was no longer a nuclear threat, but on Friday he appeared to reverse course by declaring that the North still poses an “extraordinary threat” to the U.S. In an executive order, the president extended for one year the so-called “national emergency” with respect to the nuclear-armed nation, re-authorizing economic restrictions against it. TRUMP: “We shouldn’t be hiring judges by the thousands, as our ridiculous immigration laws demand.” — tweet Thursday. Dana Leigh Marks, past president of the National Association of Immigration Judges who also works in the Justice Department’s executive office for immigration review, said funding for immigration courts has increased modestly amid a growing backlog of cases. With a backlog of 700,000, each judge would have to take on more than 2,000 cases to clear the docket. The figures also don’t take into account a wave of expected retirements that would shrink the ranks of judges. A June 2017 Government Accountability Office report determined that 39 percent of immigration judges are now eligible for retirement. Congressional investigators blamed the mounting caseload in part on the slow hiring of immigration judges. But a 1997 landmark settlement known as the Flores agreement that generally bars the government from keeping children in immigration detention for more than 20 days remains in place. Trump is seeking to have the settlement amended, but his Justice Department says the 20-day policy remains in effect until Congress or the courts take action to change that. THE FACTS: Trump’s statement is misleading. He suggests that findings of a Justice Department watchdog report by inspector general Michael Horowitz on the 2016 Hillary Clinton email investigation means that special counsel Robert Mueller’s Russia probe — which he often criticizes as a “witch hunt” — is “rigged.” The IG report determined that the FBI had made mistakes in the handling of the Clinton probe, which Horowitz described as “extremely serious.” But Horowitz dismissed the notion the probe had been rigged, saying that investigators did not uncover evidence that political bias had influenced the FBI’s conclusion that Clinton should not be prosecuted. The IG report released earlier this month also did not address questions of collusion between the Trump campaign and Russia, the subject of the investigation led by Mueller, who was appointed last year to take over the FBI’s Russia probe after Trump fired former FBI Director James Comey. TRUMP: “We’ve eliminated record numbers of job-killing regulations … we’ve cut more regulation than any other president in the history of our country whether it’s four years, eight years or in one case 16 years, we’ve cut more regulations in 500 days than any president. Even our 16-year president.” — remarks Wednesday at Duluth, Minneosta, rally. Associated Press writers Colleen Long, Robert Burns and Ricardo Alonso-Zaldivar in Washington and Elliot Spagat in San Diego contributed to this report.